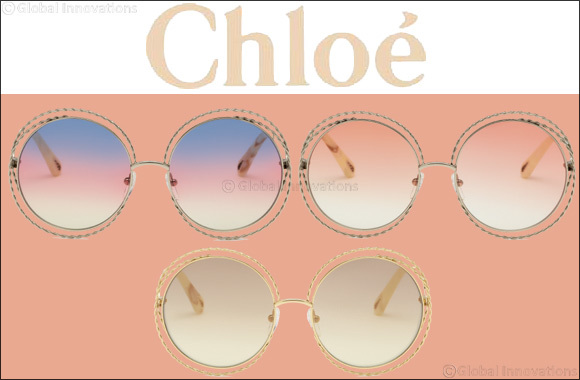 Dubai, UAE, March 19, 2018: Continuing the success of one of the brand’s most coveted styles, the iconic “Carlina” sunglass is reinterpreted with a fresh creative touch that adds instant flair to this already magnetic style. The newly designed frame is encircled with an unconventional twist motif upon intertwining metal filaments, creating a three-dimensional effect around the seemingly floating lenses. The slender, gently curved temples are adorned with a droplet-shaped cut-out – the brand’s new signature detail, which serves as an embellishment as well as a functional element to attach the jewelry-inspired chain accessory. Simultaneously ultra-feminine and alluring, the lightweight, metallic sunglass features dynamic, colored lenses which evoke shades of nature, including a playful rainbow option and a flash effect. The new “Carlina” style is offered in Gold with Peach lenses, Gold with Rainbow lenses, and Gold with Flash Brown lenses.